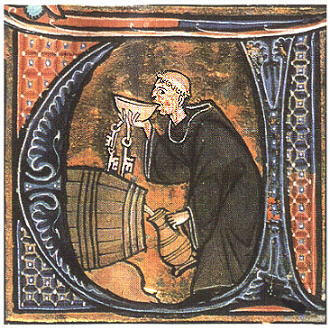 Medieval society was a highly religious place. In people’s minds the spiritual and the natural world were intertwined. Evil was all around, and battle had to be done to protect people from malignant forces that surrounded on all sides. This battle was undertaken by an army of spiritual warriors who prayed and worshiped between them around the clock for the souls of both the living and the dead. Priests, monks, friars, priors, chaplains, warrior monks, Hospitallers, nuns, vicars, chantrists, Bishops and Abbots took this fight for salvation to the enemy, and protected their flocks. Their abbeys, priories, churches, chantries, perceptories, chapels and roadside shrines dotted the landscape of Medieval Sherwood Forest in the towns and villages, and in the remote areas of the great heaths and woods (see the Monks and Friars of Sherwood Forest entry). In modern times a life in the cloth is seen as a calling- a spiritual choice based on faith. In medieval times where all the world was religious and had faith, it was a career choice taken by many younger sons of the local gentry; by clerics wishing to rise through the ranks; and by great men of the realm becoming Abbots and Bishops and wielding incredible power and attaining immense wealth. Worse still Prior Gilbert de Ponteburgh of Thurgarton Priory just outside the forest was accused of adultery with two local women in 1284, a few months later Alexander de Gedling was in trouble for swearing during a meeting of the chapter and in 1290 Walter de Bingham assaulted a John de Sutton in church and was excommunicated! Vicars, priests and monks were often known felons and members of notorious gangs who committed kidnap and extortion as well as vandalism and robbery (see Medieval Outlaws: the Folville Gang entry for more details). In 1402 the warden of the Franciscans was arrested in Leicester on a charge of sedition and in 1500 warden William Bell was charged with incontinence as a pimp!! (Marcombe and Hamilton 1998). It should be noted that the some of the clergy had a bad record of frequenting houses of Ill-repute. In London the Brothels called ‘stews’ in medieval times were controlled by the Bishop of Winchester, where the women were known as the ‘Winchester Geese’. While John was at Ratcliff (Radcliffe-on-Trent) attending his affairs, Roger ‘broke his close and entered his chamber on ‘Brydilsmythgate’’ (Modern Bridlesmith Gate), Nottingham, and ‘was found under a curtain of the bed’. He was administering Holy water! Such stories remind us that the medieval world was a colourful place. Many lay people’s lives are also recorded and will be discussed soon. During the 8th and 9th century England was subject to violent incursions by Vikings from Scandinavia- often portrayed as mindless berserkers. They rampaged around the coast of England laying waste in their tracks. They even found time to pop across the water and create Dublin in Ireland, and to visit North America on their travels. 'In this year the (Danish) army went into Mercia to Nottingham and took up winter quarters there. And Burgred, the king of the Mercians, and his councillors asked Ethelred, the king of the West Saxons, and his brother Alfred to help him to fight against the army. They then went with the army of the West Saxons into Mercia to Nottingham, and came upon the enemy in that fortress, and besieged them there. There occurred no serious battle there, and the Mercians made peace with the enemy. In the following year the raiding army returned to York'. The Vikings in the area were clearly considered hostile by the author of this account. It seems that the initial phase of Viking contact was violent, but overtime their attention seems to have turned to settlement and farming. 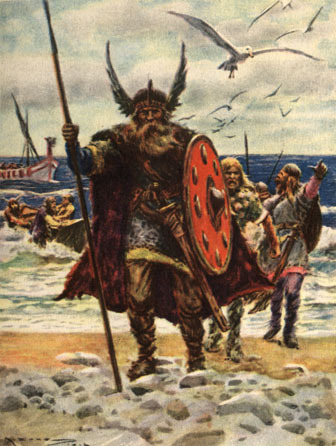 Or at least there was a large assimilation of Viking culture in the area. Either way, the area that was and would become Nottinghamshire, and subsequently Sherwood Forest took on a distinctly ‘Viking’ or ‘Old Scandinavian’ flavour. It seems probable with more modern research such as genetic sampling; that the Viking people were settling in areas which had some traditional ties to the Scandinavian world, having cultural links with the region dating back to prehistoric times. They may not have had such a hostile reception from the locals. By the 9th and 10th centuries this Viking cultural control of the area had become official with Nottingham being part of the Danelaw, an area of northern and eastern England under Danish rule. During this period Nottingham was one of five Boroughs which controlled the area of Northern Mercia, the former Saxon Kingdom now under Danish influence. This entry is not about life in Viking times, it is more interested in the legacy of these people on the landscape, language and life of Medieval Sherwood Forest. The Scandinavian cultural impact on the medieval landscape and people was immense. The dialect used in medieval Sherwood Forest is preserved in the landscape as a legacy of this cultural link. Their presence can be seen at every level; from the names of the large districts to the smallest landscape feature. The largest administrative level of society below that of the county was the ‘hundred’ a unit of authority which had its own jurisdiction and system of law courts. In Nottinghamshire in the area of the Danelaw, and subsequently in Sherwood Forest the ‘hundreds’ were known as Wapentakes. The name Wapentake comes from the Old Norse ‘vapnatak’ which may to refer to the method of voting at a meeting by raising weapons. Sherwood Forest stretched across three Wapentakes. These were Bassetlaw, Thurgarton and Broxtowe (more soon). Picture: The Wapentakes of Nottinghamshire. The use of Wapentakes instead of Hundred is a clear legacy of Viking influence down into the Medieval Forest. 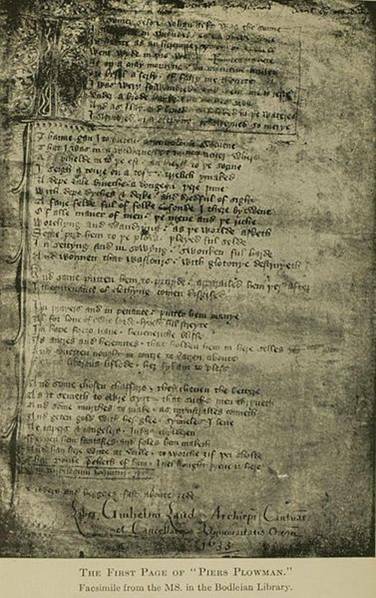 Viking influence can also be seen in the Domesday Book of 1086 through the use of the terms such as ‘Carucate’. A Carucate was the unit of land that could be a ploughed by a team of 8 oxen in a season. Outside the Danelaw this area was known as a ‘Hide’. Vikings can also be seen in the place names they left behind. Danish name endings such as ‘Thorpe’ as in Gunthorpe, and ‘by’ as in Linby are derived from Scandinavian words. The word ‘By’ still means ‘town’ in Danish today, the word ‘thorpe’ meant a settlement. The Wapentake districts named above required meeting places. One such site in Bassetlaw Wapentake has a name of Viking origin; Thynghowe. The derivation of Thynghowe is þing haugr, meaning ‘hill of assembly or meeting place’, “þ” is the old letter ‘thorn’ pronounced “th”. 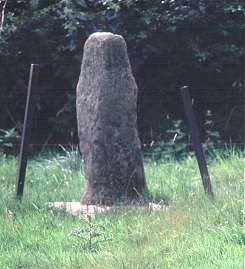 It sits on the boundary of 3 parishes and may occupy an even older site than its Viking name suggests (see Thynghowe –ancient meeting place entry for more details). 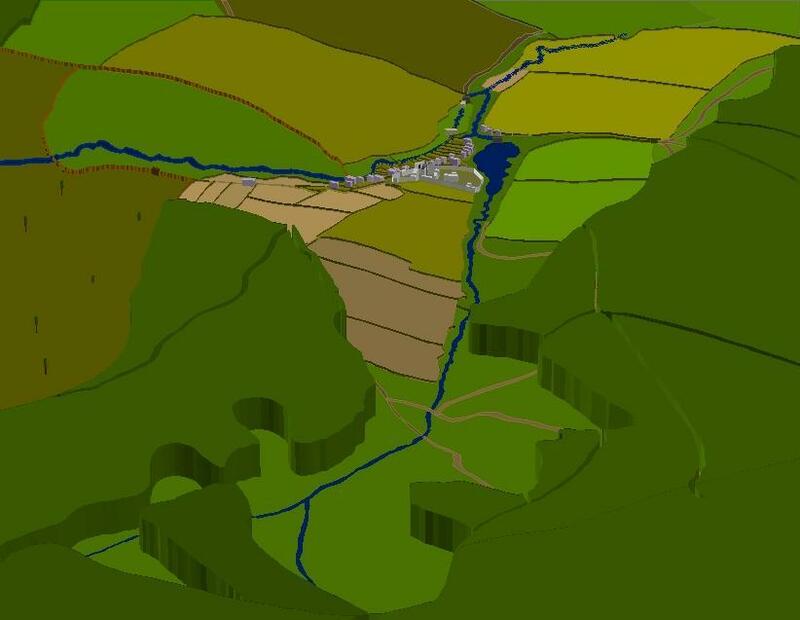 A recent award of funding from the Heritage Lottery Fund to the Friends of Thynghowe group will enable further archaeological research into the site including a LIDAR survey of the surrounding landscape (see the Friends of Thynghowe website for more information). The 'Friends of Thynghowe' have done a great amount of research into Thynghowe over the last few years looking at the history of the Danleaw and the development of the landscape around Thynghowe. 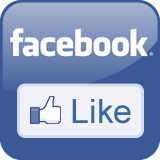 They have also promoted the site internationally at conferences and increased understanding of the site by visiting related sites across the Scandinavin world. Some of their research can be seen at http://thynghowe.blogspot.co.uk/ , and they can be followed at http://www.facebook.com/thynghowe. More of their research will doutbless emerge over the course of the project. Viking language and culture also littered the landscape of medieval Sherwood Forest in the names of landscape features and field names. Bridges such as Trent Bridge, known in medieval times as ‘Hethbethbrigg’ used the Old Scandinavian word ‘Brigge’ which still survives in the word ‘Brygga’ for jetty or bridge in Swedish. The vast areas of open heathland that characterised the forest were known as Lyngges meaning heather from the Danish word 'Lyng' (see there's Vikings in the Heather link). Streams were often called ‘Becks’ such as Doverbeck from the word ‘bekkr’ for stream, or ‘Sik’ such as ‘Stanker Sike’ in the High Forest area of Sherwood, from the word for a small stream in Old Scandinavian. Valleys were known as ‘Dales’ such as ‘Rydale’ and ‘Paddock Dale’ in Bestwood Park, from the Old Scandinavian word ‘dael’. One of the areas of crown woodland in the High Forest area known as Birklands had a Scandinavian derivation. Birklands comes from the Old Scandinavian for Birch tree ‘Birk’ and ‘Lund’ the word for wood. The Old Scandinavian word ‘kjarr’ for marshy scrubland was used in the form ‘Carr’ such as ‘Nettleworth Carr’. It survives in the name Bycarrs Dike- (the canal in the marsh of the village) combining the Scandinavian words ‘by’ and ‘carr’ (see the waterways of Sherwood Forest entry for more details). All of these uses for features in the landscape show the cultural impact of Viking people on the landscape of medieval Sherwood Forest. There are many more besides those listed. But there is enough here to give a flavour of the impact that Viking settlement in the 8th and 9th centuries had on the later landscape of Medieval Sherwood Forest from the 12th onwards. The impact on the medieval landscape is clear but can we ever know much about the actual Viking people from the 8th and 9th centuries? Unfortunately documentary evidence does not exist to give us much personal detail. Archaeology can give us a window on these people’s lives, and can show us what they ate and the tools and weapons they carried, but unfortunately can never really put name to faces. One way however is open to us where we can see the names of some of these people. They gave their names to some of the villages that cover the landscape. These are Clipstone meaning ‘Klyppr’s Farm’, Gunthorpe meaning ‘Gunnhild’s settlement’, Thoresby meaning Thur’s town, and on the edge of the Forest: ‘Vlar’ at Walesby. Scandinavian names from sometime before Domesday Book in 1089, showing again the presence of ‘Viking’ people or Scandinavian cultural influence in Sherwood Forest. Morris, J. (ed) 1977. 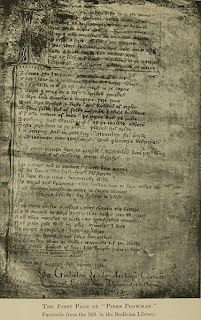 Domesday Book Nottinghamshire. Phillimore. Newstead Priory (modern day Newstead Abbey) is situated 10 miles to the north of Nottingham (see the Monks and Friars of Sherwood Forest , and Gadding about in the forest entry). In the Medieval Period it was on the western side of the 'High Forest' area of Sherwood, halfway along the western highway from Nottingham in the south to the Royal Manor of Mansfield to the north and was a favoured stop over for travellers. 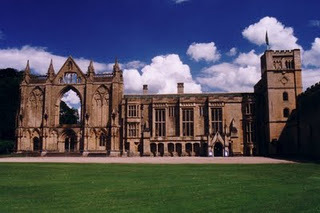 Most travellers staying at Newstead priory and taking advantage of the hospitality of the Augustinian Canons of Sherwood, who lived there, would have been travelling north or south along the western highway. However many people in the area would have been undertaking a journey as part of their everyday business in the forest. The following describes a journey through the medieval landscape of Sherwood Forest, from Newstead Priory to the Kings royal hunting palace at Clipstone 7 1/2 miles to the north east as the crow flies (see King John's Palace , Geophysical Survey of King John's Palace and Time Team at king John's Palace entries for more details). Leaving the confines of the priory the traveller would head up the western highway of the forest, still in the grounds of Newstead heading north. To the left the 'Swynisti (pigsty) dale' (not a comment on its cleanliness) rose to the east running up that way from the valley of the Leen where the priory nestled. Keeping 'Swynisti dale' to the left hand side the traveller would head further north into the 'Dedde Quene Dale' and head up through the wood that clung to is sides- 'Dedde Quendale wode'. After a short while the path swung east and emerged out of woodland after about a mile, onto the open heath land in the parish of Blidworth. The road to Blidworth climbed up onto a higher ridge of land and followed the route of the current Ricket lane. It might have been possible to see the herds of the village grazing on the heath as it stretched for 3 miles to the southeast across a number of hills and valleys. After a further mile across the heath of Blidworth the arable fields of the village were crossed by the track way. In the valley to the south lay the 'Blyworth fyspole' (the fish pond of the village) at the source of the Doverbeck River which was a boundary of Sherwood Forest further to the south east. In the valley to the north was Rainworth Water with a moated enclosure- home to the Keeper of Lyndhurst wood, which covered the hills to the north (see Lyndhurst Wood the Chief Wood of Sherwood entry). Men would have dotted the great arable fields tilling the land, and the church of St Mary of the Purification would be visible in the distance. Having passed through Blidworth the road to Clipstone ran north west towards Oxweydale the (Ox way), before striking north into Blidworth Wode. This large wood stretched for miles to the east and merged with 'Hay Wode' (modern day Haywood Oaks), 'Balkhaw', 'Syre Birkes', 'Lerche haw', 'ye Byschopes Wode' and the 'Burne Abotote wood' (the Brown Abbots Wood- belonging to the Abbot of Rufford) to form a great wood that covered much of the area. The road crossed the 'Reinwarth Forthe' (modern day Rainworth (forthe- ford)) and left the woodland canopy to once again cross a great swathe of heath land- this time the south-western end of the heath of Mansfield. It then travelled further north skirting the sides of the hill of 'Kynggus (King's) Ymmislow' and again entering woodland. Here the wood belonged to the crown and was known as 'Nomannes Wode' (the wood belonging to no man). This wood merged into another large area of woodland which included 'Wodhous Wode' (Mansfield Woodhouse Wood). The track way passed the head of a valley known as 'Falous dale', before crossing Vicar Water river at 'ye Blake Forthe (ford)'. The road then ran alongside the southern edge of the great Park of Clipstone- a Royal hunting park which was enclosed within a three metre high park fence or Pale to prevent the highly prized deer within from escaping. The traveller would not fail to be impressed by this status symbol of the Crown and would have been well aware that entry was not a wise option. The road then headed down the valley into Fliskerhaw wood, and out onto the 'launds' (deer lawns) of Clipstone Lordship. It would be at this moment that the magnificent Royal Hunting Palace of Clipstone loomed into view. Beautiful, dazzling white in the sun, and set gracefully on a spur of land between the valleys of the River Maun and Vicar Water. This Palace was impressive and dominated the landscape. Picture: King John's Palace set in its landscape from the south west (reconstruction by the author). Based on historic mapping map for University MA. The King's Houses at Clipstone- now known as King John's Palace were white-washed and set against a landscape of woodland and deer lawns, encircled on the far side by a great pond, and separated from the approach of a traveller from the east by a large ditch and possibly a palisade. 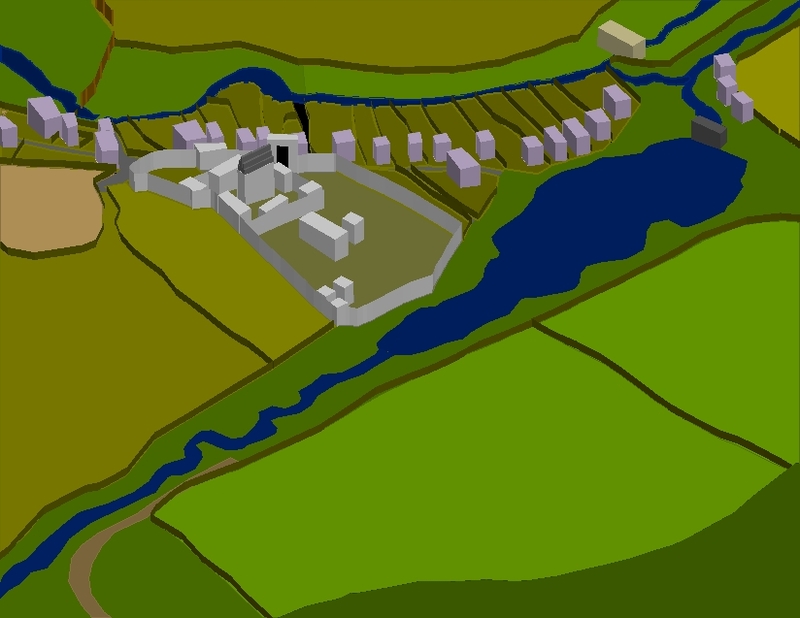 Picture: A reconstruction of king John's Palace from the south (by the author) based on historic mapping for University MA. It should have been possible for a traveller to find accommodation in the village (provided the King wasn't in town with his retinue- or even worse holding parliament (more soon)- which would cause all accommodation in the surrounding villages to be filled, let alone in Clipstone). An important visitor might find accommodation in one of the many halls and dormitories within the royal complex, and enjoy hunting at the king's pleasure in his park. But for all travellers, of high and low status, the arrival in this sylvan retreat would have been greatly welcomed, as the forest had been safely navigated for another day. and Randolf Earl of Chester. Alongside Robin Hood in this same poem another collection of medieval outlaws gets a mention... the Folvilles. This excerpt suggest that there were some people called the Folvilles who obeyed their own rules and sorted out deceitful or 'false' men with their own brand of the law. Were these men honourable as the poem suggests? Fine upstanding sorts who brought justice to the land in the fashion of their literary more famous contemporary? ...became a notorious gang of extortionists, robbers, vandals, hired thugs and murders. In 1326 in one of the most famous crimes of the day also involving Roger de la Zouche they murdered Roger Bellers a Baron of the Exchequer on the road from Melton to Leicester. In 1327. They had returned and are recorded as committing a series of robberies in Lincolnshire. ‘Robert and Simon de Folville, with a band of malefactors, were roaming abroad in search of victims to beat, wound, and hold to ransom’. A Simon de Folville is listed in an inquisition Post Mortem in Nottingham in 1356 into a robbery in 1335 (see a robbery in the forest 1335 entry for more details)... is this the same Simon de Folville? Between 1327 and 1330 Eustace alone was involved in 3 to 4 murders and 3 robberies. In 1329 they were pardoned in exchange for fighting for the king . However while garrisoned with the kings army in Leicester they robbed the burgesses of the town of their belongings!!! In 1330. Their pardon was overturned. Then in 1331 they were hired for £20 by the a Canon of Sepringham and the Cellarer of the Cistercian house of Haverholm to destroy a rivals watermill!! ...On the 14th January 1332 the Folville gang and a number of associates kidnapped the future Chief Justice of the Kings bench Sir Richard de Willoughby. They smuggled him into Lincolnshire and moved from wood to wood to avoid capture. James Coterel of the similarly notorious Coterel family gang from Derbyshire who ran riot in the High Peak Forest with his brothers John and Nicholas (more about the Coterels soon). The aptly named Roger Savage! and not forgetting… Alan Baston the Canon of Sepringham who had hired the Folvilles to smash the watermill. A collection of thugs, thieves, scoundrels and ... Vicars!!! A Trailbaston Commission (a sort of posse of judges) was sent to bring the felons to justice. The commission in fact failed to bring anyone to justice! Before too long Eustace was serving the King again, this time in the hundred years war which had recently started. Once again serving the king seems to have earned him a pardon. In fact Eustace died a natural death in 1347 having never faced justice. In 1340 Richard Folville took refuge in the church of Teigh in Rutland where he had been priest for 20 years. We know all about this because it was recorded in a Papal Bull (from the Pope himself) into the incident. Because Richard Folville was a priest taking refuge in a church (despite his rather dubiuos record) the execution was deemed unlawful. ‘disturbers of the peace are said to gather together daily to do evil; they ride in force by day and night taking and robbing people at their will, imprisoning some of them until they have made grievous (or sometimes ‘intolerable’) ransoms. They form congregations and conventicles and wander in woods and other public and private places, ambushing wayfarers whom they rob and sometimes slay. In all these things they are aided and abetted by local people, who incite them to their evil deeds and shield them after they are done’. (Stones, E. 1956. The Folvilles of Ashby Folville, Leicestershire, and their associates in crime, 1326-1347. 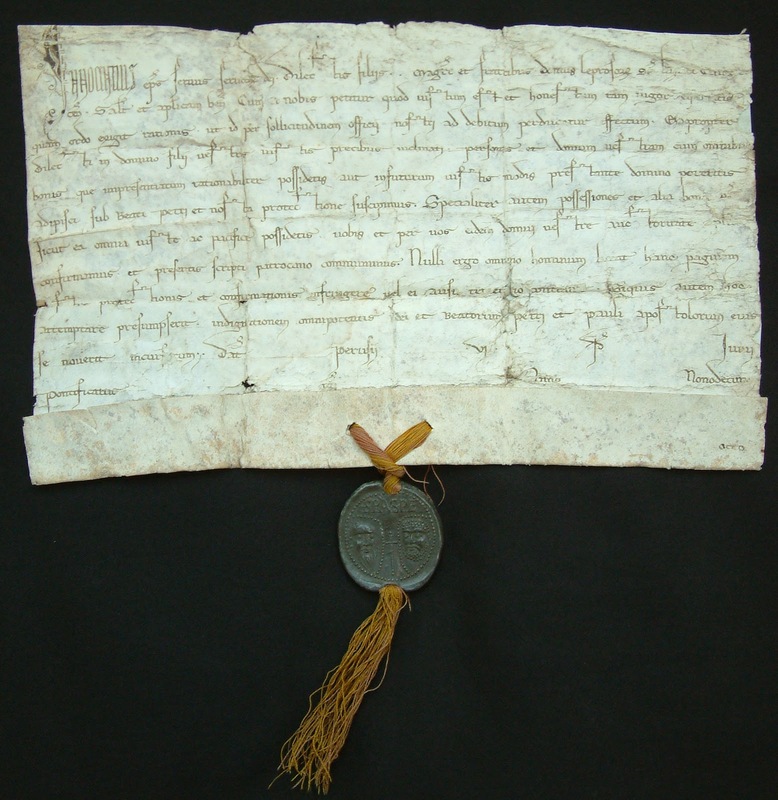 Transactions of the Royal historical Society 77). It is interesting to note that the common people of the time would shelter outlaws in safe houses. Outlaws were seen as heroes even in their own time- the Langland poem was written only a few years after the Folvilles crimes were committed. It is easy to see how such characters became legendary. Many of the exploits of the outlaws above have been absorbed into the myths of Robin Hood. The eariest ballads of the man in green show he was not against bouts of extreme violence himself (chopping off Guy of Gisbornes head and dancing around with it on a pole for starters). These accounts also go someway to explaining why in the early ballads Robin had a dislike for Bishops and the clergy. There aren't many religious men mentioned above who would make good role models to their flock. The thirst for such tales (often full of violence and trickery) was as strong in medieval times as is it to this day. Every Medieval forest in England had a keeper. This was a person directly appointed by the King, and they oversaw the Foresters (the police force of the forest) and the Agisters (the tax collectors of the forest) amongst other duties. These Keepers of the Royal Forests could be responsible for more than one forest (see forest law page for more details). In Nottinghamshire the Keepers of Sherwood Forest were for many generations hereditary. These hereditary keepers of Sherwood Forest (or the Forests of Nottinghamshire), were the De Caux family, and later through marriage the Birkin and then the D'Everingham families. They were based at Laxton Castle, Nottinghamshire. After: Crook, D. 1980. The early keepers of Sherwood Forest. Transactions of the Thoroton Society LXXXIV, 14-20. Of the 11 hereditary keepers of the Forest up to 4 were women! Of the first- a Basilia De Normanville little is known- she was perhaps married to Robert De Caux under the command of Henry I (Crook 1980). There were 2 Maud De Caux's in the late 12th and early 13th century. One was the others aunt. The first Maud De Caux had her position and that of her heirs confirmed in a charter by King John between 1189-94 at Derby. She was succeeded by her aunt after dying without heir - the keepership did not trasnfer to an arm of the Fitz Stephen family, but stayed with the second Maud De Caux. In 1204 King John took over Laxton Manor for himself- but the keepership remained in the hands of Maud De Caux. - suggesting the office was hers not her husbands! So it seems that up it was possible for women to hold positions of power in Medieval Sherwood Forest, even that of the keepership. 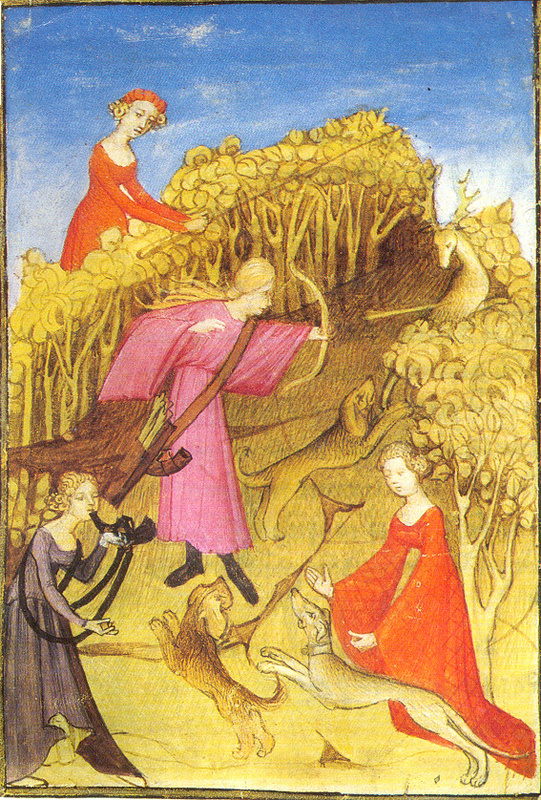 This did change once the king granted the keepership to favoured individuals following the stripping of the keepership from Robert D'Everingham in 1287, but it shows that the role of women in Sherwood Forest in the Medieval period should not be underestimated.